27-September-2007 : Come On Ride The Rails Once In A While! While my posts on Flying With Fish typically involve flying, I’d like to take a moment and discuss another mode of transportation…….no not he car, I hate driving, not the bus either, nope not even chartering a private yacht, I’d like to discuss taking the train. All over the world the railroad system is extensive and can get you almost anywhere. In Russia you can travel by train from Moscow to Vladivostik, you can grab a high speed train from Paris to London passing under the English Channel, but here in the United States the railroad system is fairly poor and difficult to use outside of the Northeast Corridor (with the exception of commuter rail systems throughout the country). You may ask why I am discussing traveling by train since I live in the United States and this blog is about flying. Well the answer is simple, I live in the Northeast Corridor and my two closest international airports are both 100+ miles away in either New York of Boston. In fact my local airport, New Haven (HVN) only has six flights per day, all six flights are on turbo props and all six flights only fly to Philadelphia (PHL) , which means I use the train often. Today’s assignment is taking me to Philadelphia, about 220 miles from home. Flying from HVN to PHL seems to be the logical choice right? Well not in this case. To fly from HVN to PHL less than 7 days from the date of departure is usually close to $800 round trip for the 59min flight! The same trip on Amtrak (www.amtrak.com)is $125. While I fly this route often for various reasons, let’s look at the break down to why I often use the train. Travel Time On Amtrak from Old Saybrook (OSB) to Philadelphia 30th Street Station (PHL) is about 4 hours. To fly from HVN to PHL includes the following, 35 minute drive to the airport, a minimum of 45 minutes at the airport prior to the flight, 59 minutes on the flight, 15 minutes to taxi to the gate, 10 minutes to get out of the airport. 15-20min waiting for the train into the city, 15 minutes on the train to the 30th street station. This is 3hrs and 30min of travel of constantly moving. If I check baggage (which I almost never do) I need to ad at least another 30min of time to this flying scenario. So, for me, if I can save a lot of money, sit in one seat, relax, watch two movies, work, eat a snack and travel for roughly the same amount of time I choose to use the rail system to get to work. In reality, since I live near nothing, HVN is 35 min away,both Hartford (BDL) and Providence (PVD) at an hour drive, and JFK and Boston (BOS) are both nearly 2.5-3hrs away depending on traffic, I use the train often. The train takes from easily from my train station to Boston’s South Station, then onto BOS or it takes me to New York’s Penn Station and on to JFK or Newark (EWR) and Amtrak I can go see the world. Don’t be a total air snob, explore your options and see if you can save money (often by taking Amtrak to JFK I can save almost $500 on flights to Europe!!). Check out what they may be able to offer you at www.amtrak.com or call them at 1(800)USA-Rail. Oh, why was I in Philly today? I was hired to work as the personal documentary photographer for both Bono of U2 and Former U.S. President George HW Bush at the Liberty Medal Awards. Below are a few shots from my day with Bono and Former President Bush. @Steven–Great shots of of Geo HW Bush with Bono. 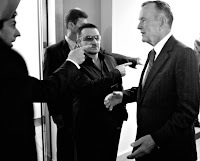 I loved the 3rd shot down of Geo HW Bush with Bono in BW. Looked very candid and conveyed a relaxed atmosphere. I learned of your blog from Scott Kelby’s blog and read you on a regular basis. I flew this past weekend from ORD->LGA and back with carry-on of Nikon DSLR, carbon fiber tripod and assorted glass with no problems (or requests from TSA to take out my body from the ThinkTank bag). George Bush & Bono, strange bed fellows indeed.